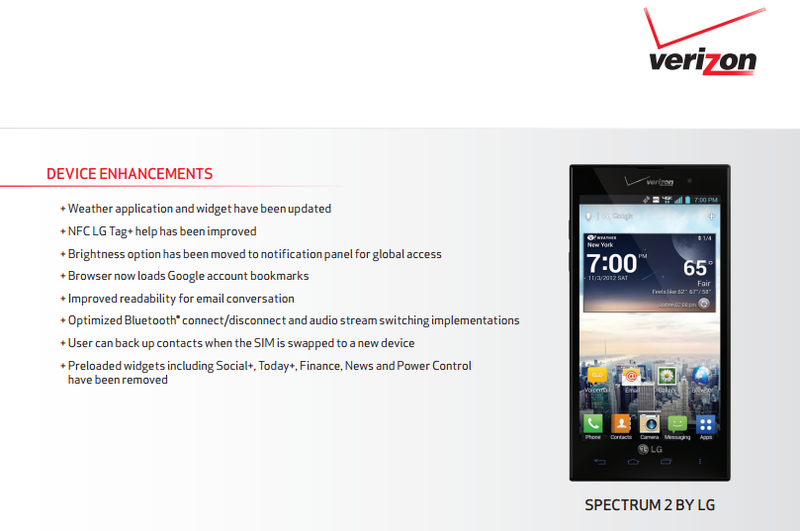 This afternoon, Verizon approved the Android 4.1 “Jelly Bean” update, build number VS93021B for the LG Spectrum 2. With Jelly Bean comes a ton of great features like Google Now, expandable notifications, camera software enhancements and more. Along with Jelly Bean, they have fixed some other things such as their NFC LG Tag software, their stock weather application has been updated, and a few of the pre-loaded widgets on the device have been removed (Social+, Today+, Power Control, etc.). If you are the owner of the Spectrum 2, expect to see this update start rolling out sometime this week to your phone.